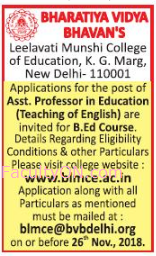 Leelavati Munshi College of Education, New Delhi has advertised in THE HINDUSTAN TIMES newspaper for the recruitment of Assistant Professors jobs vacancies. Interested and eligible job aspirants are requested to apply on or before 26th November 2018. Check out further more details below. About College: Bhavan’s Leelavati Munshi College of Education (BLMCE) offers full time B.Ed programme, recognized by NCTE and affiliated to Guru Gobind Singh Indraprastha University (GGSIPU), Delhi. The duration of B.Ed. course is 2 years (full time). College has 100 seats for B.Ed course. Seat allocation is done by the affiliating university for 100% seats as the college has surrendered Management quota seats also to the students. How to Apply: Interested and eligible candidates are requested to forward their application filled in downloaded application format along with copies of certificates and a recent PP size photo to the following email address. A hard copy of the Resume in the prescribed format with copies of testimonials and publications should be sent on or before 26th Nov 2018 to the following postal address.